Scientist Richard Dawkins, an atheist known worldwide for arguing against the existence of God, has described himself as a "cultural Christian". He told the BBC's Have Your Say that he did not want to "purge" the UK of its Christian heritage. The comments came after Tory MP Mark Pritchard accused "politically correct" people of undermining Christmas. 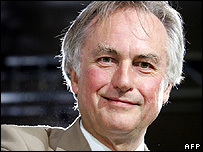 Professor Dawkins, author of the God Delusion, added that he liked "singing Carols along with everybody else". On Have Your Say, Mr Pritchard told Prof Dawkins there was an "increasing feeling" that "many of the main Christian festivals are being sidelined and marginalised, sometimes by stealth, sometimes openly". This, he argued, would allow groups such as the British National Party, to utilise Christian imagery for their own ends. Prof Dawkins, who has frequently spoken out against creationism and religious fundamentalism, replied: "I'm not one of those who wants to stop Christian traditions. "This is historically a Christian country. I'm a cultural Christian in the same way many of my friends call themselves cultural Jews or cultural Muslims. "So, yes, I like singing carols along with everybody else. I'm not one of those who wants to purge our society of our Christian history. "If there's any threat these sorts of things, I think you will find it comes from rival religions and not from atheists." Last week, Mr Pritchard called a parliamentary debate on "Christianophobia". The MP for The Wrekin, Shropshire, complained that Christian heritage was being undermined by secular officials and public figures. During that debate, community cohesion minister Parmjit Dhanda told MPs that Christianity had had a "significant impact" in securing people's rights and freedoms. He added: "I fully recognise the full historical and cultural significance [of Christianity] in our country. "We should all be aware of that and celebrate that." And the head of the Equality and Human Rights Commission, Trevor Phillips, said schools were wrong if they thought celebrating Christmas excluded children who were not Christian. He said: "Christmas and the celebration of Christmas in this country, though it is a religious festival, is one in which people who are of no religion - or other religions - can share."